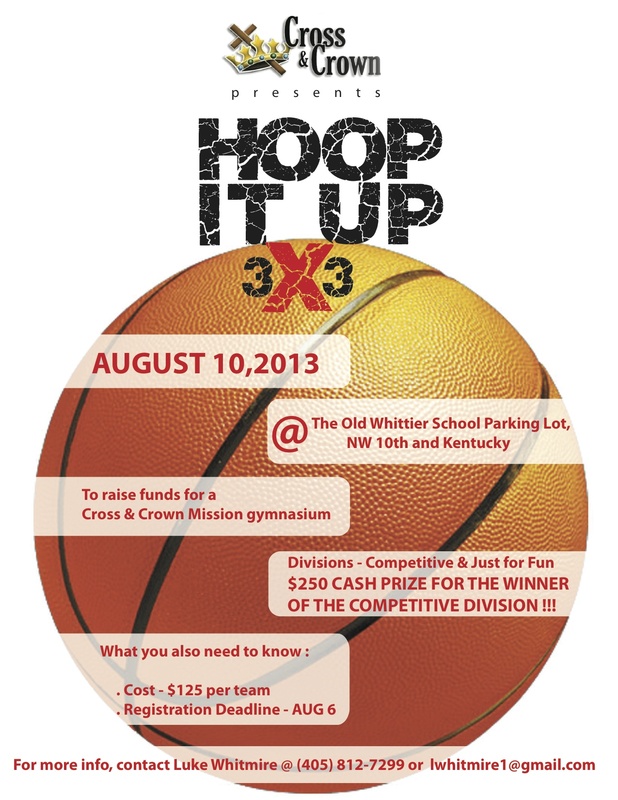 Cross & Crown will be hosting a 3v3 basketball tournament in the old Whittier school parking lot this coming August. The objective is to raise funds that will go towards constructing a gymnasium, as well as, create an overall awareness of our vision and hope for the gymnasium. Below is some general information about what is taking place and how you can be involved. Call or email if you have any questions. Who – Cross & Crown staff, neighborhood volunteers, participants & you! Become a sponsor – Whether you are a church, business or individual we would love for you to be involved by way of a monetary donation. If you have a banner, flag or other means of advertisement we would love to display it during our event. Filling volunteer positions – Listed below are times and responsibilities we need filled. Volunteers are welcome to fill multiple time slots. Donating resources – Listed bellow are items we need donated. Monies towards items, as well as, the items themselves are welcome. All donations are tax deductible.